Udagamandalam (Ooty) is referred as the "Queen of Hill Stations" in South India, perched at an altitude of 2240 m. at the Nilgiri District of Tamil Nadu, where the two ghats converge. This enchanting hill station is filled with tea and coffee plantations apart from trees like conifers, eucalyptus, pine and wattle. This strikingly green abode of misty blue hills of the Nilgiris,called Ooty Hillstation, remained hidden till the British discovered it in the early 1800s. Earlier it was known as Ootacamund. Ooty Hill station India makes a perfect destination for vacation in South India because of the beautiful green hills, the cascading waterfalls and sparkling brooks, apart from the other attractions such as lakes, Madhumalai wildlife sanctuary, Botanical gardens, etc. There are many things for the tourists to enjoy in Ooty Hillstation like the mesmerizing beauty of the lofty mountains, dense forest, sprawling grasslands and miles and miles of tea gardens during their vacation here. 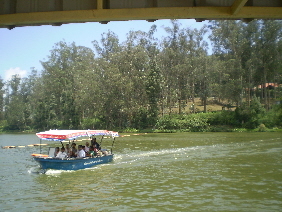 Ooty Lake behind the Main Bus Stand. Botanical Gardens, sprawled over an area of 50-acre. Rose Garden of about 10 acres with many varieties of roses. Mini Garden on the way to Boathouse. Pykara, with wildlife habitat, Water falls, boat house, restaurant and a rest house, is 19 kms from Ooty. Scroll down and see the video. Avalanche, 28 kms from Ooty, is a nature lover's paradise, with a lake ideal for fishing, and bird watching. Kalhatty Waterfalls of 100 feet in height are located on the Kalhatty slopes, 13 kms way. Kotagiri, located about 28 km from Ooty, is the oldest of the three hill stations of Nilgiris. It is a beautiful hill resort that has wonderful tea estates and pleasant weather. Mudhumalai wildlife sanctuary, with rich flora and fauna, is 67 km from Ooty. This sanctuary is home for many endangered species. Mukkurthi Peak and National Park - located around 40-km from Udagamandalm, on the southern corner of the Nilgiri Plateau. Ooty Hill Station is one of the top tourist places in Tamil Nadu. See more pictures of Ooty here. By Air: The nearest airport is in Coimbatore, 100 km away. (46 kms), Mettupalayam to Udagamandalm (Ooty), is connected by a Mountain Railway which is 4 hours journey. By Road: Ooty is well connected by roads to all major cities in the country.